I would suggest that you make sure your calendar is clear before purchasing The Alice Network. The true story of a World War I female spy ring serves as the skeleton of this fast paced book filled with intrigue, brokenness, and courage. Two different timelines, one set in 1947, the other starting in 1915, weave together to tell at gut-wrenching, heartbreaking story of brave women determined to make a difference in the most difficult of circumstances. This book is not about perfect women, but imperfect women doing the best that they can in a very broken world. Book includes questions for book clubs, plus letters and trial records that inspired this fictional story. I finished this book in a matter a days. Simply could not put it down. Highly recommend for book clubs. 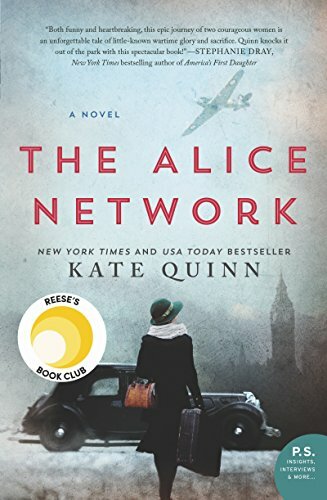 American author Kate Quinn’s new historical novel “The Alice Network”, is set in two times – 1915 and 1947 – and the two stories are told in alternating chapters. The first one is told in the third person, while the second is told in the first person. That’s a tricky maneuver for the best writer, but Quinn carries off one section quite well, while doing not as well in the other. The first story is about a British spy network – the “Alice Network” -operating in German-occupied northwestern France. Most of the agents were women and they were led by a real character, Louise de Bettignies, whose code name was “Lili”. She was joined by fictional British/French Evelyn Gardiner, whose code name was “Marguerite”. Marguerite was posted to work in a French collaborator’s restaurant in Lille, serving the German diners and picking up tidbits along the way she’d pass to Lili, her British handler. The second story is set in 1947 and is the story about Evelyn Gardiner – now aged – and Charlotte St Clair – a 19 year old American who has come over to France with her mother to obtain a safe, legal abortion in Switzerland. She meets up with Eve and Eve’s chauffeur, a Scot soldier named Finn. They are all looking for something, someone, in post-WW2 France. The second part is definitely the weaker of the two sections. Somehow, Eve – who was drawn really well in the first section – has devolved a bit into a caricature in this section and neither Finn or Charlie seem too real, either. I’m giving the book 4 stars because the first part is 5 star, while the second is 3 star. By the way, Kate Quinn writes about a real incident that happened in a small town outside of Limoges a few days after the DDay landings in Normandy. The Germans destroyed a village called Oradour-sur-Glane and murdered most of the residents. All told, over 600 people were murdered by a detachment of the Waffin-SS, who were looking for French partisans, supposedly operating out of the village. If you’re interested in knowing more about this heinous crime, please look into Ethan Mordden’s marvelous short novel, “One Day in France”. It was published in 2015 and is still in print.